Whopper's Bunker: Zalzala Jazeera not "Cobra Island"
In contrast to the devastation and destruction caused by a 7.9 earthquake in Pakistan that killed more than 500 people on September 24th; a new terrestrial body emerged from the depths of the sea off the coast of the country. 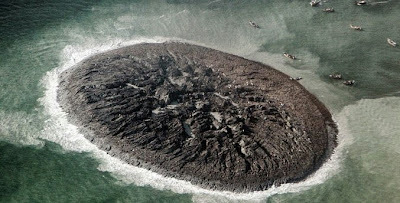 Locally called Zalzala Jazeera [earthquake island], the formation is 380km from the quake’s epicenter in Paddi Zirr Bay near Swadar, Pakistan. It was speculated by some international observers that UNETIDA/UNPASID weapons testing in the Arabian Sea on September 22nd may have lead to the massive earthquake. However Rear Admiral "Tridente"Carlos, Director of Naval Operations for UNETIDA/UNPASID denied the claim citing that the tests were carried too far away and in fact, closer to the Indian Ocean off the coast of Sri Lanka. UNETIDA/UNPASID's Director of Research and Development, Dr. "Quantum" Pataal also confirmed that the weapons being tested were not capable of increasing tectonic stress. "What do you think we were trying to do? Create a sort of Cobra Island; a new sovereign nation from which to launch super-clandestine black operations around the globe without being answerable to any specific country's government? Nonsense!"